I've just returned from three runs to the tip in the Yaris, a total of 30 miles of winding country lanes plus a two mile long straight through the middle of a forest. I moved house a week ago and the seller left the garage full of old drawers and off-cuts of wood. Surely the Yaris couldn't swallow much could it? Well, actually it could. Fold the rear seats, but sadly not flat, and the Yaris in van mode can take one largish set of drawers, two small ones and a load of other junk besides. Result! The sound system is fine but doesn't come with DAB digital radio. Within around 30 seconds of turning the engine on and Bat Out Of Hell is blaring through the speakers, streamed via Bluetooth from my iPhone. The Yaris looks quite cheap and cheerful on the inside with only some small concessions to design and style. The test car's black colour scheme doesn't really suit the car on the inside or out. Go for a brighter colour and that new front end, as well as the interior, looks much more funky. The engine doesn't have much torque as it's naturally aspirated but 98bhp and 1,000kg means it's quite quick enough if you thrash it, and returns decent mpg for a petrol car. I've seen 41mpg on short runs with my foot planted. 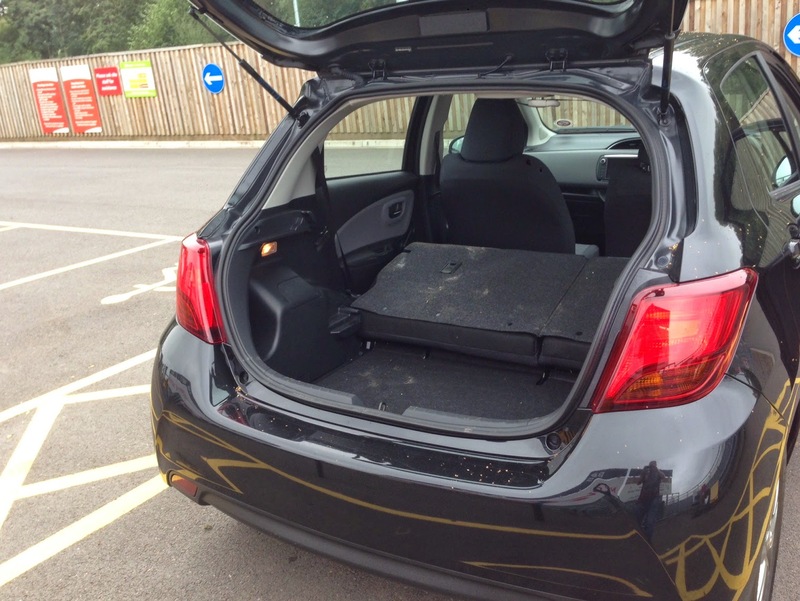 It's quite spacious internally, and the boot is of a good size and has a flat floor (although there's no spare tyre). It's quite a vanilla car in that it doesn't stand out in any one area and it lacks any real wow factor but it is quite charming and is imbued with character, if you care to look for it. I'll publish a full review in a few weeks.